New & used retail clothing store located in the heart of the town! Focusing on the trendy styles of today, this store offers it all. 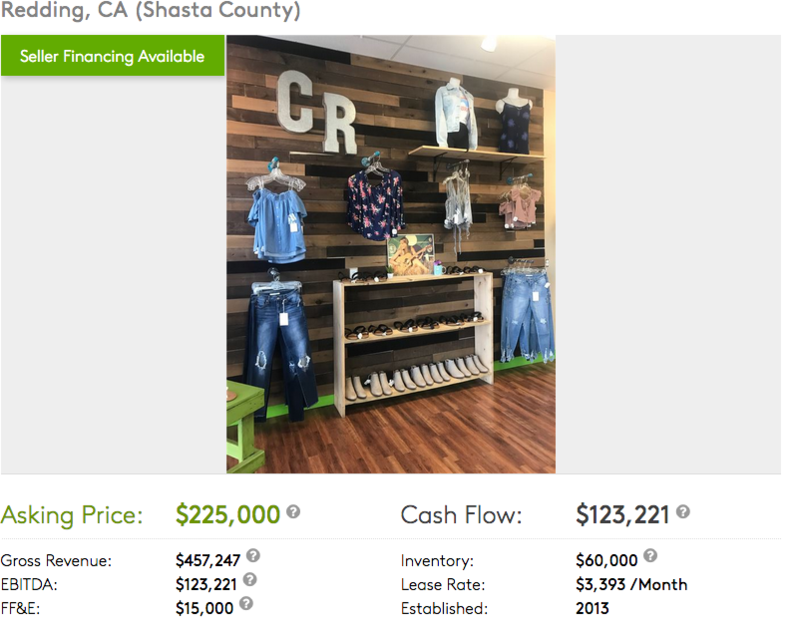 Large boutique area with brand new fashion favorites plus racks filled with adorable gently used top name brands and styles makes this store a town favorite! Strong repeat customers with new clientele building daily. Ideal location in Redding, CA. This store is turn key with management and an excellent sales staff in place. Established customer base with nearly 20,000 Facebook followers and growing. Huge opportunity for a new owner to grow the business through online sales and increased local marketing. The current owner lives out of state and has not reached the potential this store has. Stable- Business does even better in a down economy! Owner operator can replace manager salary for additional income. Please contact us for more information. Upon receipt of a NDA we will send you all the financial information on the business. Competition: Little to no competition. Business does better in a down economy!